After going 2-2 during a rain shortened road trip, the Yankees are back home against the Miami Marlins where they routed them very easily 12-1 at the Stadium. With a rare two-day hiatus from baseball thanks to Mother Nature, the Yanks came out firing early, and often, scoring 11 runs in the first five innings. With ace Luis Severino on the mound for the Yanks they piled on the runs, scoring two in the first inning from an RBI single off the bat of the rather hot Gary Sanchez, and then a bases loaded walk by Tyler Austin later in the inning. 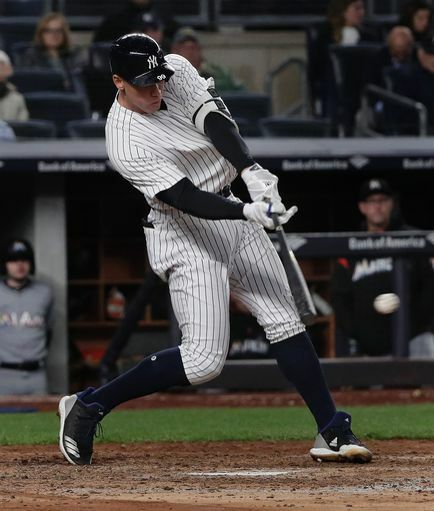 With two outs in the bottom of the second, Aaron Judge became the quickest man to 60 career home runs in major league history after hitting a solo-shot to right center, his fourth of the season. In the bottom of the third, Aaron Hicks ripped a two-run double into the left-centerfield gap, extending the lead to 5-0. 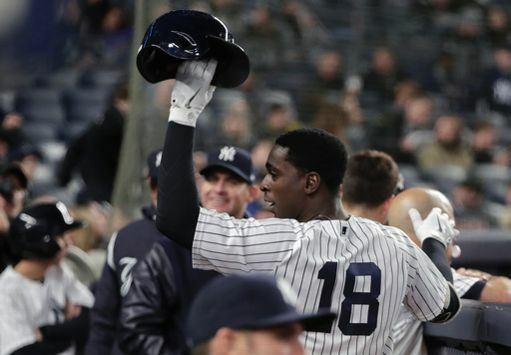 In the fourth inning, Sir Didi Gregorius lined one into the right field seats for a two-run home run to extend the lead to 7-0. The fifth inning is where the Yankees really piled it on, with Miguel Andujar, Judge and Sanchez driving in four runs. To cap it off, Gregorius hit another home run in the bottom of the seventh inning, a solo- shot, to extend the lead to 12-0. This was his second multi-homer game of the season, and the sixth overall by the Yankees on this young season. The Marlins ended the shutout with one out in the top of the eighth from a Justin Bour RBI groundout. The Yankees did not need to score 12 to get a win for Severino as he was dominant from the get go. He went six shutout innings, giving up only on hit and striking out 8 on 86 pitches; a complete bounce back after a poor start against the Red Sox in Fenway. Looking ahead to Tuesday night and game two of this two game series against the Marlins. The Yankees send Masahiro Tanaka (2-1, 5.19 ERA) to the mound against Miami’s Jarlin Garcia (0-0, 1.13 ERA) with first pitch set to be at 6:35 PM EST. You can watch the game on YES.